Five hundred years after they reigned, we're as gripped by the Tudors as ever. We've recently been treated to Hilary Mantel’s Man Booker-winning novels about life at the court of Henry VIII, stage adaptations of those books by the Royal Shakespeare Company, a film version of Philippa Gregory’s Tudor novel The Other Boleyn Girl and the corset-ripping television series 'The Tudors' that ran for four seasons. Italian audiences in the first half of the 19th century enjoyed a similar glut. Opera composers were on the hunt for plots to fuel their audience’s love of high drama, and were drawn to the Tudor era like moths to a flame. Gaetano Donizetti's Tudor trilogy Anna Bolena (1830), Maria Stuarda (1835) and Roberto Devereux (1837) are probably the most famous today – but in fact Donizetti first forayed Tudor-wards in Elisabetta al castello di Kenilworth (1829). Adapted in a roundabout way from Walter Scott's Kenilworth, the opera dramatizes Elizabeth's infatuation with the younger Leicester – as we'll see, a favourite theme for Donizetti and his compatriots. 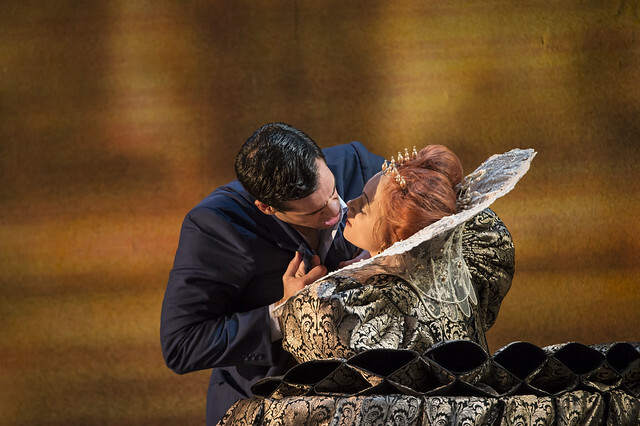 Anna Bolena takes its inspiration from Henry VIII’s cold-blooded disposal of his second wife Anne Boleyn; the opera portrays her sympathetically, a victim of Henry’s changeable moods. Donizetti's two last Tudor operas returned to the reign of her daughter, Elizabeth, and as with Il castello di Kenilworth, he depicts her as a tyrannical, moody and indecisive queen, in love either with Leicester or Devereux. Donizetti’s Tudor trio might be the most famous Italian operas to draw on the tempestuous family, but they certainly weren't the only ones. Gioachino Rossini’s Elisabetta, regina d’Inghliterra (1815) returned yet again to the relationship between Elizabeth and Leicester; Michele Carafa's Elisabetta in Derbyshire (1818) has Elizabeth bustling in Fotheringhay; Saverio Mercadante’s Maria Stuarda, regina di Scozia (1821) follows the brave young Mary's battles with rebellious Scottish leaders; there were yet further Maria Stuardas from Pasquale Sogner (1815) and Carlo Coccia (1827); and Giovanni Pacini's Maria, regina d'Inghliterra (1843) and Carlos Gomes's Maria Tudor (1879) looks to an earlier period, at 'Bloody Mary' and her love for another young man. Love, revenge, executions, power struggles, family feuds – is it any wonder we remain fascinated by the Tudors? But why did this period of English history appeal to a group of 19th-century Italian composers? Queens themselves were a rarity at the time in continental Europe, and seeing so many together on the stage had a sensational attraction in itself. The Catholic-Protestant tensions of the Tudor period was another tool Italian composers could use to intrigue their largely Catholic audiences. Italy was also a divided country at this time. Napoleon had redrawn the map and much of the country was ruled over by foreign powers – who weren't averse to seriously censoring these conflict-ridden operas, with Donizetti's Maria Stuarda a famous victim. In his Tudor operas, Donizetti depicts a turbulent world ruled by absolute monarchs, swayed only by their whims while their subjects lived in fear of causing offence. Maybe Donizetti and co.’s fascination with the famously turbulent times of the Tudors is not so surprising after all. Maria Stuarda runs until 18 July 2014. Tickets are still available.